Eating disorders are a serious mental health issue which can put a life at risk. Make sure you understand these harmful myths about eating disorders before writing off what could be a serious problem in a loved one’s life. Someone with anorexia nervosa should have been able to notice they were getting dangerously thin. Someone with bulimia nervosa should have realized throwing up after every meal wasn’t healthy. Someone with binge eating disorder should have known eating so much wasn’t healthy. It’s easy to apply a lot of “shoulds” to mental illnesses when we don’t understand them. Eating disorders aren’t the fault of someone who has one because they haven’t done anything wrong. They became preoccupied with pain in their lives and found maladaptive coping behaviors to deal with them. Over time, the eating disorders took over control . 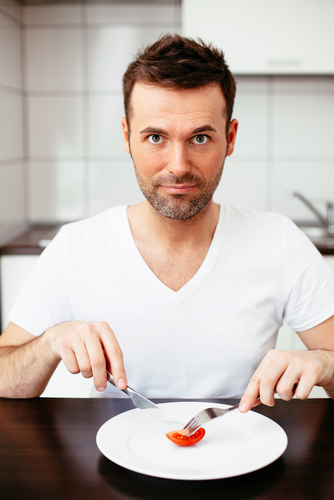 Binge eating disorder, one of the most widespread eating disorders, has a large male population. Eating disorders and body image disorders of any kind are not restricted to women. Researchers feel that it is this myth and the social focus on females with eating disorders which prevents more males from coming forward about their struggles. Eating disorders aren’t about watching what someone eats. It’s about obsessing, restricting, controlling, and punishing themselves about what they eat. Losing nutrition, hurting the body, and causing a lot of emotional pain is more than just observancy. It’s an illness. Many eating disorders begin as extreme dieting, then turn into harmful habits which can be life threatening. The preoccupation with weight, food, and body image has little to do with those things at all. Underneath the surface of someone with an eating disorder is usually tremendous emotional pain which never found a healthy way out. This myth is partially true. An eating disorder places a very serious focus on the self, what the self eats, and how the self looks- especially how the self is perceived by others. Taking these things too seriously causes distorted reality and false beliefs which lead to more destructive behaviors. It is because someone with an eating disorder takes themselves so seriously that they cause organ failure and can die. Hired Power is a recovery management resource for helping you and your family navigate the tumultuous waters of eating disorder recovery. From intervention to aftercare, Hired Power is here to help you through each phase of transition. For more information, call 1-800-910-9299.